In November of 1991 my wife Dido won a Winston Churchill Traveling Fellowship to Chile to study the role of folk dance as a therapeutic tool for children with learning problems. Because it was going to be a long trip – about three months in all – and we had been married less than a year we decided that I would go along too. As it happened, Dido required her work with the kids to be recorded and as I had some experience with cameras she appointed me her video cameraman. 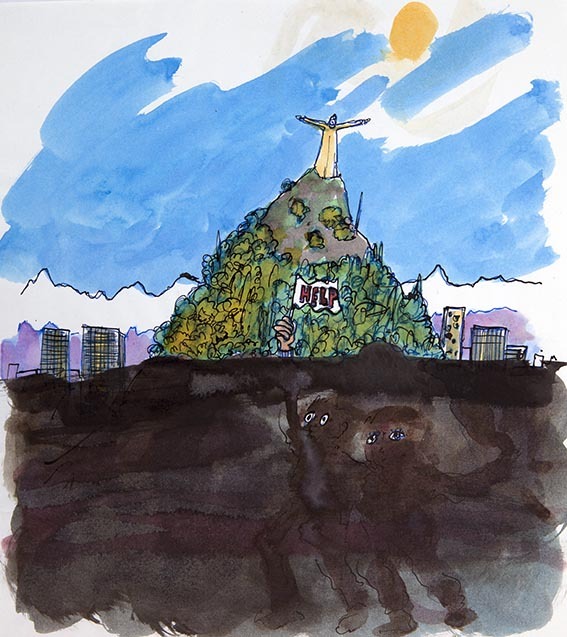 When we arrived in the country, Chile had been a democracy about the same length of time that we had been married, so this was a dramatic voyage of discovery in more ways than one. In fact, looking back on that trip now after nearly a quarter of century, I think that Dido and I agree that it remains one of the two or three most remarkable experiences of our time together. We had decided to keep a written journal of the trip even before we left England, but within a few days of our arrival so many weird and wonderful – not to mention hysterical – things had happened to us that I decided to record the most amusing and surreal in a series of cartoons. Presented here are those thirty-three pictures – made literally on the hoof; on trains, on buses and even on planes as we traveled the length (there is no breadth) of one the world’s most spectacular, most beautiful and most crazy countries. These pictures are a humorous and very affectionate record of all aspects of the then new democratic Chile through the eyes of two wide-eyed newly-weds. In the words of Inti Illimani – “VIVA CHILE”!! 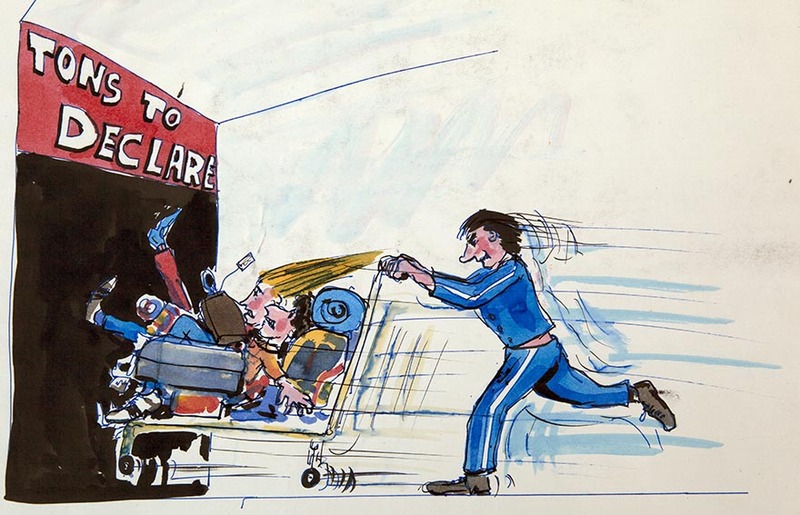 When we arrived at Santiago Airport we were virtually kidnapped by a trolley porter who then took us through the red channel. When we were then searched by fearsome looking Carabineros and I couldn’t find the paperwork for the large video camera in my possession. My explanation that the camera was not new and the property of the Ealing Educational Authority failed to impress the policemen who then separated me from Dido and escorted me – with the camera – to a small room by the side of the customs hall. Once in the room they told me to sit down on a low wooden chair in the corner and to keep the camera on my lap. There was a glass window in the middle of the opposite wall through which I could see a very worried Dido still standing among all our ransacked baggage and suit cases. For about twenty minutes I was left alone with one Carabinero, who stood leaning against the door just staring at me expressionlessly. Then two more policemen entered the room and – ignoring me completely – turned on a TV fixed to a bracket suspended from the low ceiling. There was a football match on and soon all three men were totally engrossed, occasionally shouting at the screen. At first I’d been too frightened by my predicament to take much notice of the game, but as the minutes passed I realised it was an international game and one of the teams was Chile. And then, as fear turned to boredom I began to watch the match too until I finally recognised one of the Chilean players. Without thinking, at the moment I recalled his name I blurted out it out, “Ivan Zamorano!” The three jackbooted Carabineros all instantly turned to look at me with looks of amazement on their faces. Then, one of them who spoke English asked me, “Zamorano! You know him?” “Of course! He plays in Italy for Internazionale” I replied, then added, lying through my teeth, “He’s one of my favourite players. I’m a big fan!” And with that it was as if I had turned on a switch. Next thing I knew, the three men were all smiles and charm personified and I was being escorted back to Dido, with our camera and sent on our way. Who says football is just a game… The first thing you noticed upon arrival in Santiago back in 1991 (I’m sure it’s improved by now) is an all pervading smell from the heavy smog, trapped over the city by the surrounding mountains. The smell was distinct and highly reminiscent of burnt cooking oil. The only way to be outside and escape the smog was to climb the famous Cerro San Cristobal hill that rises some 300 meters above the city. However, the problem with this was that the climb was steep and until one emerged from the polluted air very painful on the lungs. 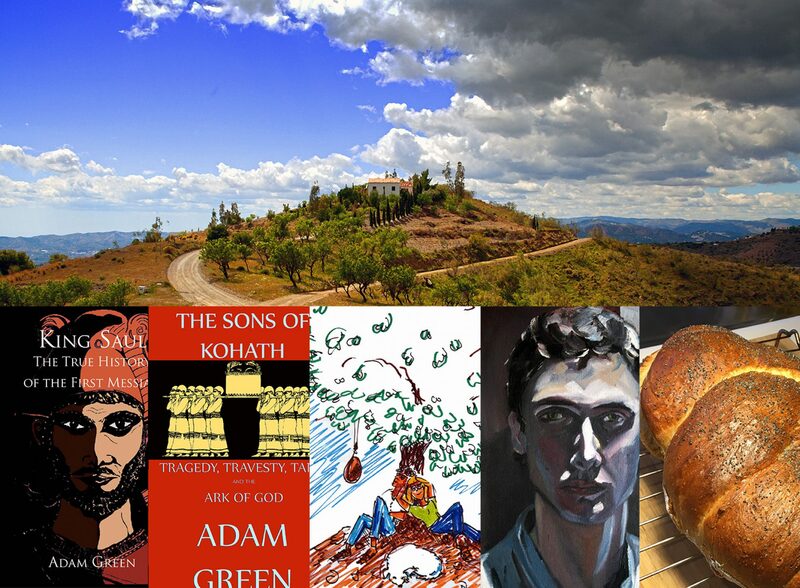 Still, the rewards were both clean air, and once at the top, beneath the statue of the Virgin Mary, stunning views of the Andes rising above the city like a sheer and mighty snow-capped parapet. There must have been many culprits responsible for Santiago’s poor air quality back then, but I guess the greatest contribution were the hundreds (if not thousands) of small buses speeding about all over town, belching great gobs of black sooty exhaust from their tin chimneys. More daunting than their exhaust though, at least to the newly arrived foreign traveler was negotiating how to use the things. Each minibus had its own peculiar route scrawled on its side in barely legible graffiti-like writing. 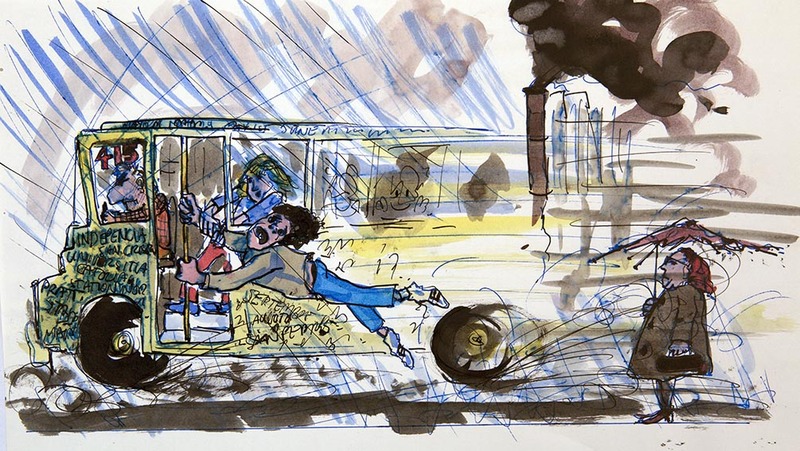 Then, once one had decided to gamble on a particular vehicle, and waved it down – there didn’t seem to be any official bus-stops – one had to literally leap on before the impatient driver lurched off almost immediately. On several occasions either I or Dido were too slow and ended up being dragged along the curb, holding onto the door rail for dear life. This is presented with the presumption that people looking in are familiar with the concept of cholent. 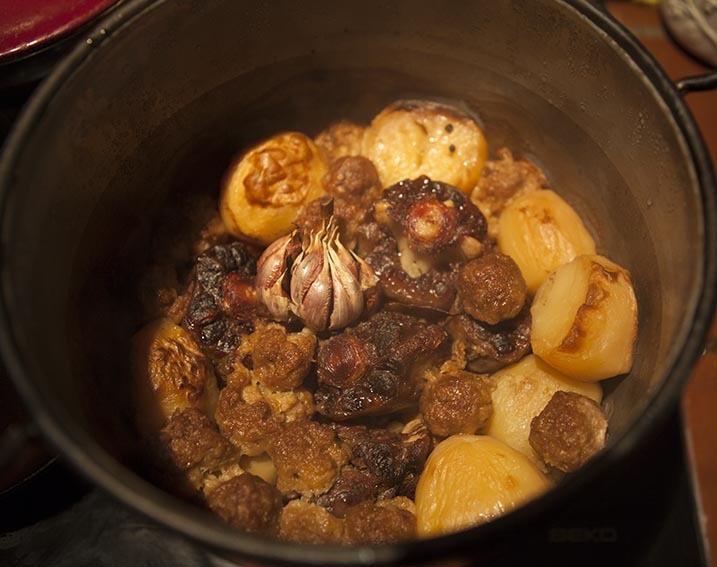 For those of you who may not know anything about this Sabbath staple of Ashkenazi Jewish winter cuisine (not to be confused with the Sephardic chamin) I would direct you to http://en.wikipedia.org/wiki/Cholent for a fairly concise explanation of its history and development. 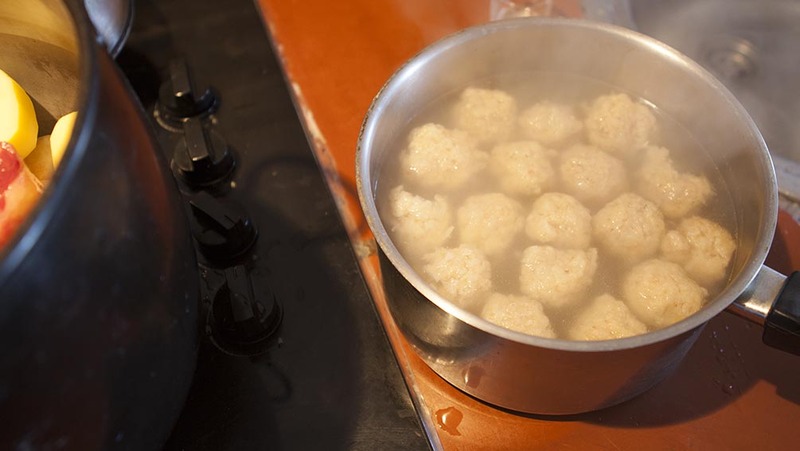 In common with most traditional “family dishes” there are as many nuances of the basic recipe as there are people who cook it. 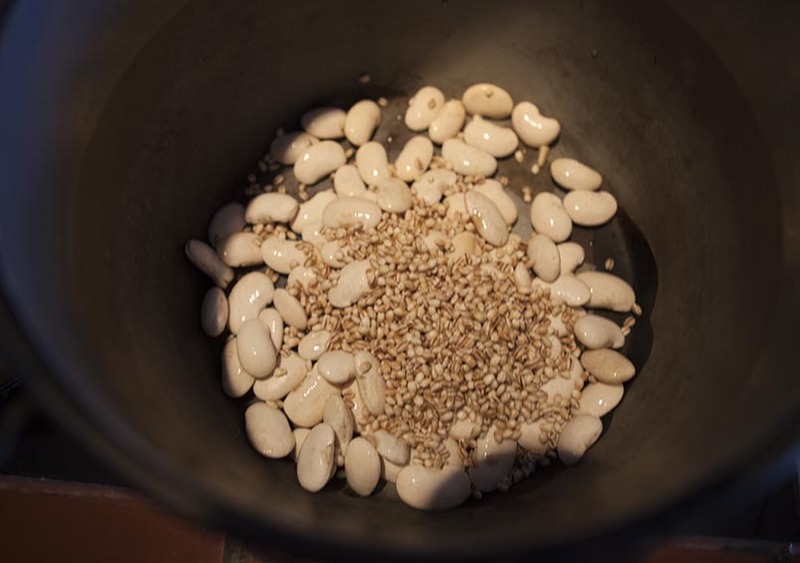 The one I present here is based on the very plain cholent recipe my booba (my grandmother) used to cook and which we all loved, but with several embellishments which I’ll explain as we go along. 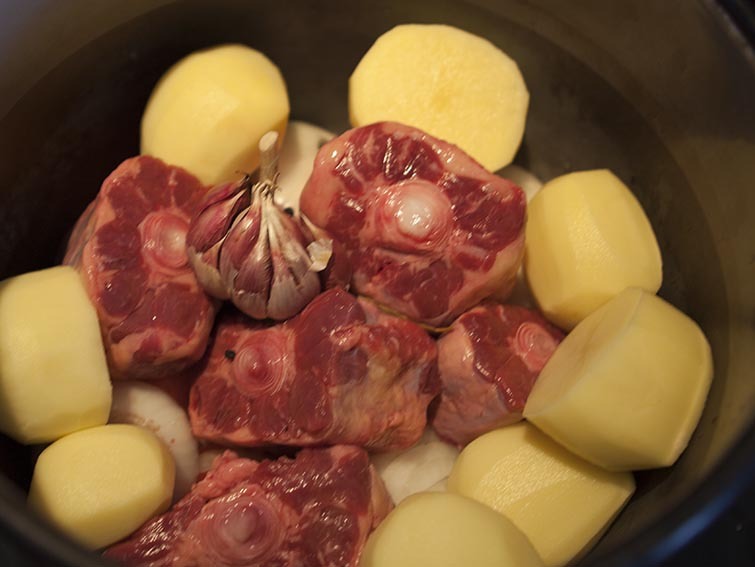 By using oxtail, rather than one of the normal cuts of beef – typically from the forequarters of the animal – I am going against all tradition, even my own! 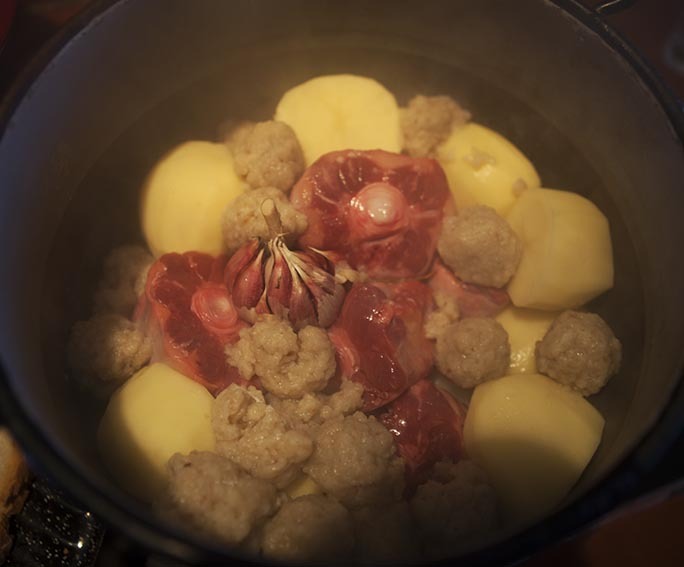 My reason for using oxtail though, was purely pragmatic in that I wanted to make a cholent, and oxtail was the only thing I had in the freezer. 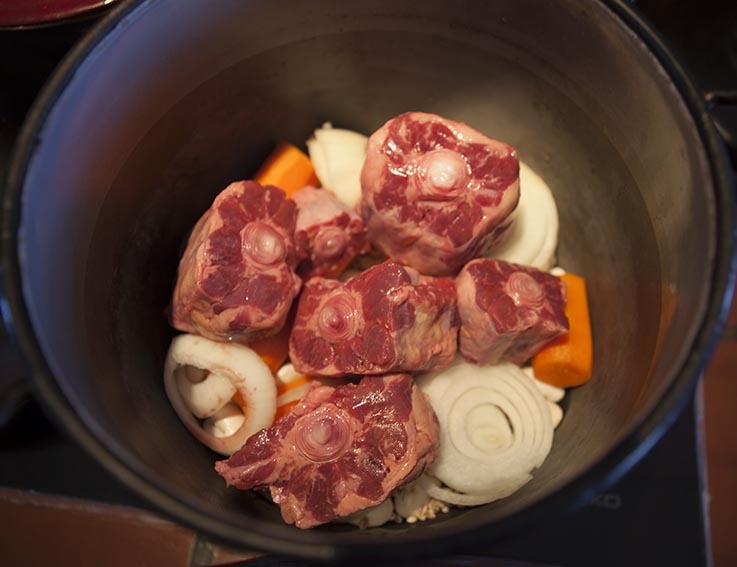 And although not traditional, oxtail has all the basic qualities required for this long, slow cooking process, in that it is a fat and sinuous meat. 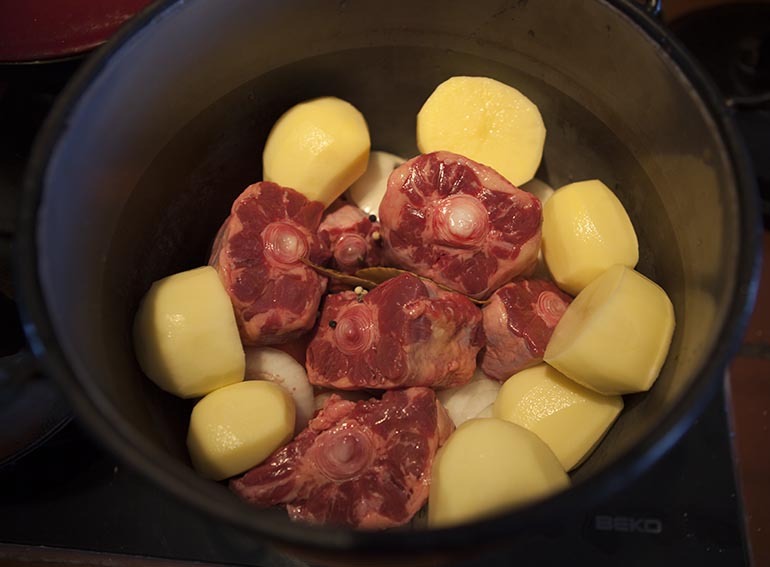 Sadly, for most observant Jewish readers of this post – unless you reside in Israel and perhaps certain parts of the States, you probably won’t be able to get your hands on kosher oxtail. 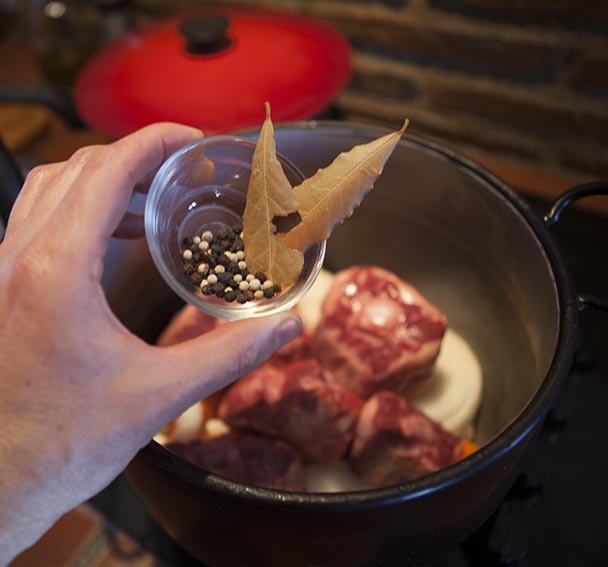 If that is the case, use a cut of fat beef on the bone; a meaty piece of shin would work well or a large top rib. 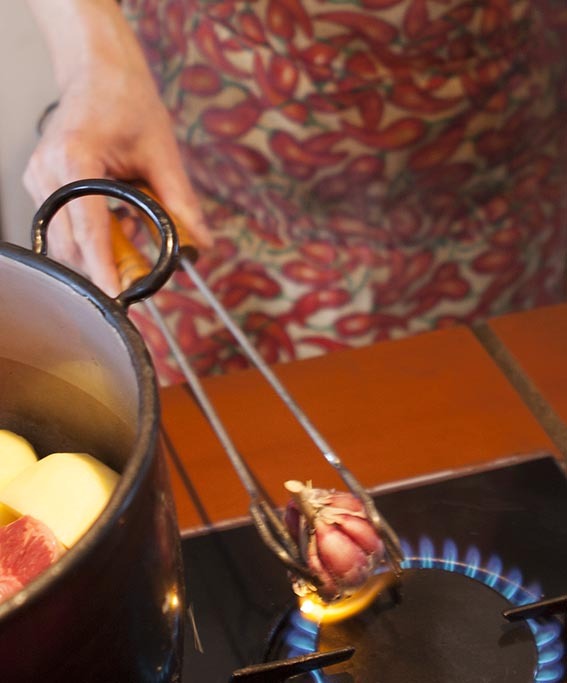 It also helps to have a wood burning stove such as I have here in Spain – perfect for slow cooking at low temperatures – but any real oven will do. 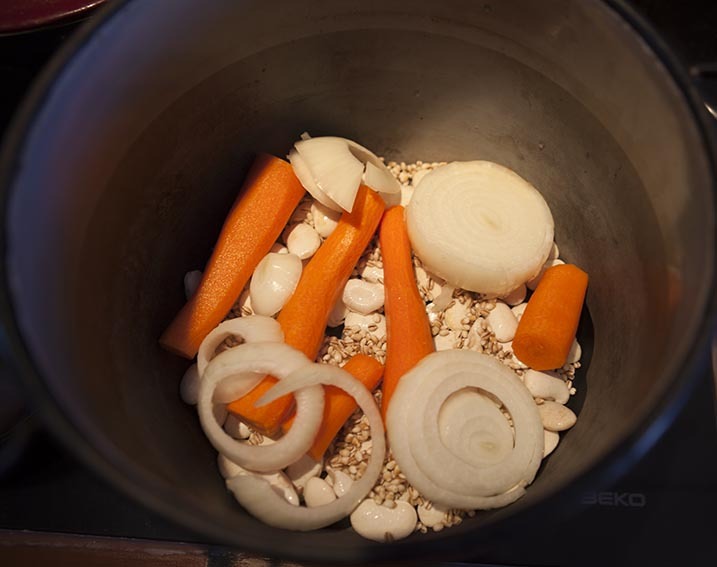 Avoid however, electric slow cookers and dutch ovens as you’ll end up with all the flavour escaping from the ingredients into the liquid: Fantastic if you want a brilliant soup, but not if you want a rich, unctuous hotpot where each component is packed with flavour. 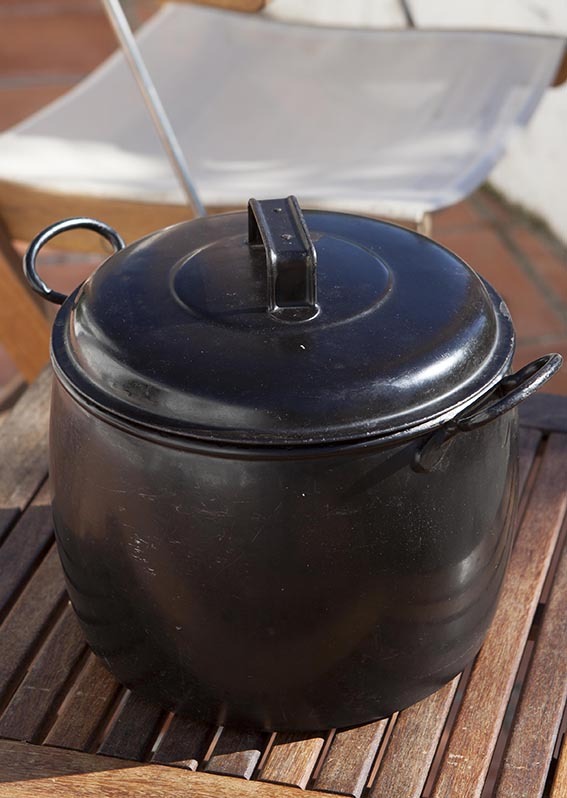 This is my grandmother’s old cholent pot – and probably her grandmother’s before her -perfect for the task. 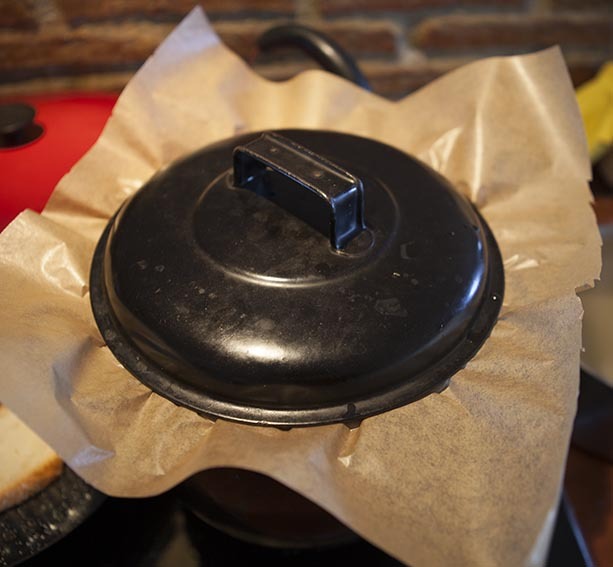 11) Finally, seal the lid of the pot with a piece of baking parchment or tinfoil…. 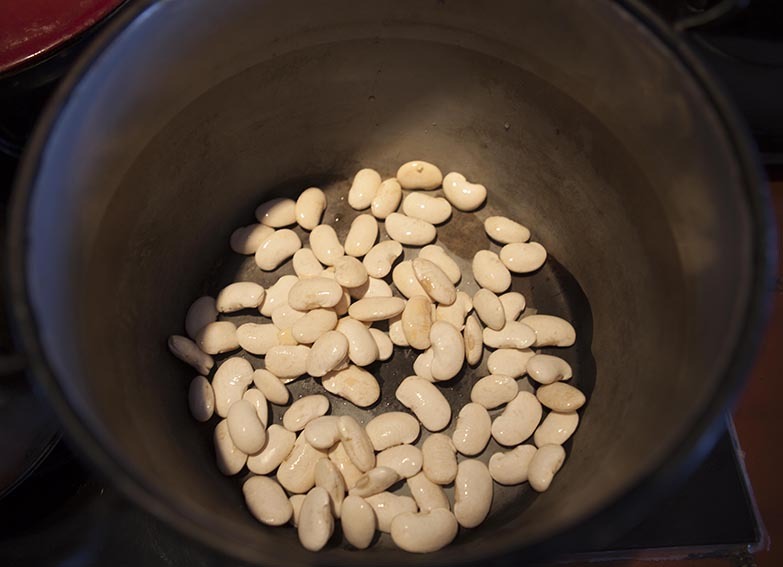 12) Put the pot into the preheated oven and cook at 200°c (180° fan) for two hours, then turn the heat down to about 110°c (90° fan) and cook for a further 6 hours – or longer if preferred. At no time during the cooking be tempted to lift off the lid. 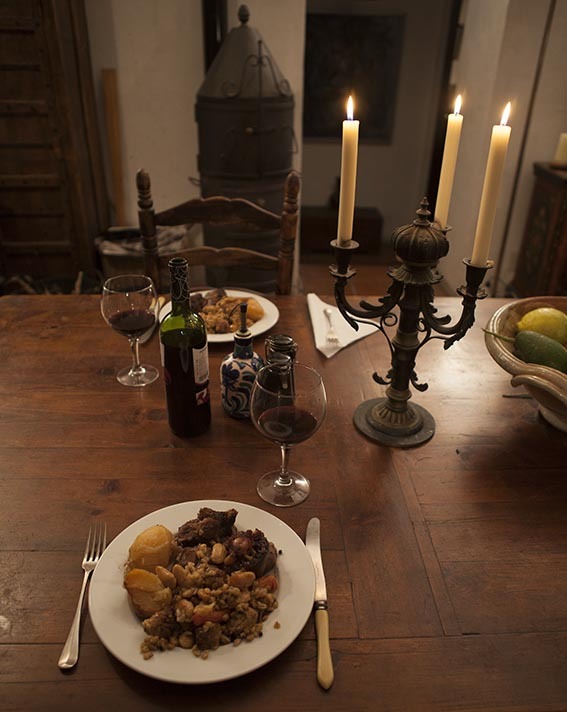 And finally you want to serve it with a good heavyweight red with plenty of complementary “beef” of its own – betey avon!! HERE IS A SERIES OF DIGITAL “GOUACHES” OF CORNWALL. THE RIVER SCENES ARE ALL OF THE EXQUISITELY PICTURESQUE HELFORD RIVER. THERE ARE ALSO PICTURES FROM COVERACK, THE MINACK THEATRE, THE LIZARD PENINSULAR AND SAINT MICHAEL’S MOUNT.